Notable alleged blown calls: Mets-Braves, May 22, 2007; Cubs-Pirates, May 27, 2009. 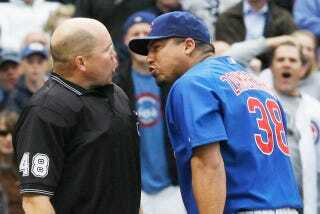 Claim to fame: Causing Cubs pitcher Carlos Zambrano to completely lose his mind in May 2009. Video showed Carlson's call was correct, and Zambrano was suspended for six games. And though Carlson's walk rate increased substantially after 2007, he remained favorable to pitchers, posting the second-lowest R/9 among umpires from 2007 through 2009. ... Although he isn't known for a short fuse, he doesn't take a lot of guff, either. His career ejection rate of 2.6 percent is nearly 20 percent higher than average. Perhaps a new set of guidelines for job performance is what we need. If they can't be followed, well, Mark Carlson...you're outta here! Sample PITCHf/x strike zone: June 6, 2011. Starters Cliff Lee and Ted Lilly combined for 14 strikeouts, and it's easy to see why. True fact: Served in the Marine Corps for one year before being honorably discharged for medical reasons. On umpiring: "You can't get caught up in the moment. You have to realize you are doing your job, [that] 50,000 people are here."